For the Matthew Shipp album, see The Multiplication Table. "Times table" redirects here. For a table of departure and arrival times, see Timetable (disambiguation). The oldest known multiplication tables were used by the Babylonians about 4000 years ago. However, they used a base of 60. The oldest known tables using a base of 10 are the Chinese decimal multiplication table on bamboo strips dating to about 305 BC, during China's Warring States period. The multiplication table is sometimes attributed to the ancient Greek mathematician Pythagoras (570–495 BC). It is also called the Table of Pythagoras in many languages (for example French, Italian and Russian), sometimes in English. The Greco-Roman mathematician Nichomachus (60–120 AD), a follower of Neopythagoreanism, included a multiplication table in his Introduction to Arithmetic, whereas the oldest surviving Greek multiplication table is on a wax tablet dated to the 1st century AD and currently housed in the British Museum. In 493 AD, Victorius of Aquitaine wrote a 98-column multiplication table which gave (in Roman numerals) the product of every number from 2 to 50 times and the rows were "a list of numbers starting with one thousand, descending by hundreds to one hundred, then descending by tens to ten, then by ones to one, and then the fractions down to 1/144." 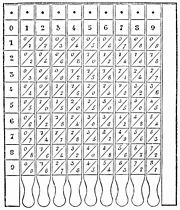 In his 1820 book The Philosophy of Arithmetic, mathematician John Leslie published a multiplication table up to 99 × 99, which allows numbers to be multiplied in pairs of digits at a time. Leslie also recommended that young pupils memorize the multiplication table up to 50 × 50. The illustration below shows a table up to 12 × 12, which is a size commonly used in schools. This form of writing the multiplication table in columns with complete number sentences is still used in some countries, such as Bosnia and Herzegovina, instead of the modern grid above. Figure 1 is used for multiples of 1, 3, 7, and 9. Figure 2 is used for the multiples of 2, 4, 6, and 8. These patterns can be used to memorize the multiples of any number from 0 to 10, except 5. As you would start on the number you are multiplying, when you multiply by 0, you stay on 0 (0 is external and so the arrows have no effect on 0, otherwise 0 is used as a link to create a perpetual cycle). The pattern also works with multiples of 10, by starting at 1 and simply adding 0, giving you 10, then just apply every number in the pattern to the "tens" unit as you would normally do as usual to the "ones" unit. Look at the 7 in the first picture and follow the arrow. The next number in the direction of the arrow is 4. So think of the next number after 7 that ends with 4, which is 14. The next number in the direction of the arrow is 1. So think of the next number after 14 that ends with 1, which is 21. After coming to the top of this column, start with the bottom of the next column, and travel in the same direction. The number is 8. So think of the next number after 21 that ends with 8, which is 28. Proceed in the same way until the last number, 3, corresponding to 63. Next, use the 0 at the bottom. It corresponds to 70. Then, start again with the 7. This time it will correspond to 77. Tables can also define binary operations on groups, fields, rings, and other algebraic systems. In such contexts they can be called Cayley tables. Here are the addition and multiplication tables for the finite field Z5. For every natural number n, there are also addition and multiplication tables for the ring Zn. For other examples, see group, and octonion. The Chinese multiplication table consists of eighty-one sentences with four or five Chinese characters per sentence, making it easy for children to learn by heart. A shorter version of the table consists of only forty-five sentences, as terms such as "nine eights beget seventy-two" are identical to "eight nines beget seventy-two" so there is no need to learn them twice. 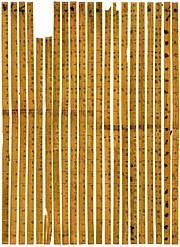 A bundle of 21 bamboo slips dated 305 BC in the Warring States period in the Tsinghua Bamboo Slips (清华简) collection is the world's earliest known example of a decimal multiplication table. In 1989, the National Council of Teachers of Mathematics (NCTM) developed new standards which were based on the belief that all students should learn higher-order thinking skills, and which recommended reduced emphasis on the teaching of traditional methods that relied on rote memorization, such as multiplication tables. Widely adopted texts such as Investigations in Numbers, Data, and Space (widely known as TERC after its producer, Technical Education Research Centers) omitted aids such as multiplication tables in early editions. NCTM made it clear in their 2006 Focal Points that basic mathematics facts must be learned, though there is no consensus on whether rote memorization is the best method. ^ Trivett, John (1980), "The Multiplication Table: To Be Memorized or Mastered! ", For the Learning of Mathematics, 1 (1): 21–25, JSTOR 40247697 . ^ a b c Jane Qiu (January 7, 2014). "Ancient times table hidden in Chinese bamboo strips". Nature News. doi:10.1038/nature.2014.14482. ^ David E. Smith (1958), History of Mathematics, Volume I: General Survey of the History of Elementary Mathematics. New York: Dover Publications (a reprint of the 1951 publication), ISBN 0-486-20429-4, pp. 58, 129. ^ David W. Maher and John F. Makowski. "Literary evidence for Roman arithmetic with fractions". Classical Philology, 96/4 (October 2001), p. 383. ^ Leslie, John (1820). The Philosophy of Arithmetic; Exhibiting a Progressive View of the Theory and Practice of Calculation, with Tables for the Multiplication of Numbers as Far as One Thousand. Edinburgh: Abernethy & Walker.